What is Gua Sha and Kinesio-Taping? 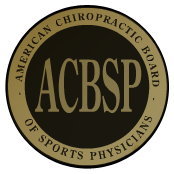 Dr. Jason J. Peloquin of Bay Ridge Brooklyn, NY, has obtained the postgraduate designation of Certified Chiropractic Sports Practitioner (CCSP) by the American Chiropractic Board of Sports Physicians™ (ACBSP™). The CCSP certification requires the doctor to attend a minimum of 100 hours of a 120 hour postgraduate program. This instruction is specific to physical fitness and the evaluation and treatment of injuries encountered in sports. Following the completion of these hours, the doctor must then take and successfully pass a comprehensive written examination. This training will aid the doctor in the prevention and treatment of athletic injuries by enhancing his diagnostic skills and patient care. The CCSP accreditation exists to provide a uniform standard of education that assures teams and athletes that the doctor has met a minimum level of competency in chiropractic sports medicine. Dr. Peloquin joins over 5200 others internationally who hold this designation.